Roto Harrow is the ultimate arena conditioner....not just another harrow. Roto Harrow actually "conditions" your arena footing. Unlike conventional harrows, Roto Harrow levels your arena surface by redistributing the material inward, making it an excellent tool to remove berms off arena and round pen walls and fence lines. It also eliminates the washboard effect from your arena surface. Roto Harrow is unsurpassed in building loft and air into your footing, which is an all-important factor in maintaining soundness in your horses. Roto Harrow pulverizes any clods in your arena. Roto Harrow is equally at home in in your pastures, turn-out pens and round pens. Roto Harrow is about the only harrow I have found that will condition and level the footing underneath your horse walker. Because of its rotating action, you can follow your horses path and condition and send the displaced material back beneath your walker. 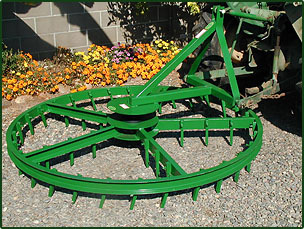 In addition, Roto Harrow is designed to designed to aerate, pull weeds, level soil and gather trimmings in orchards and vineyards, without snagging and damaging the vines or trees. Roto Harrow is at home in your pastures. It pulverizes and scatters manure piles and will scarify the surface and prepare it for seeding, while removing dead grass and weeds. Roto Harrow is self-cleaning. Roto Harrow is crafted from 3" channel iron with a heavy-duty, American-made hub and spindle assembly (with sealed bearings) for maximum strength and long life. The 3-point hitch assembly is crafted from heavy duty steel tubing. The unit is available with either straight or angle, and/or standard welded or replaceable teeth. The standard model is constructed with welded 3/4" steel teeth. High carbon steel teeth are also available. Your Roto Harrow should be about 1 foot wider than the rear tires of your tractor for maximum benefit.